Important: Once Knights of the Eternal Throne (KotET) is launched at the end of November 2016, Common Data Crystals, along with other crystals and commendations will be exchanged for credits. Spend them while you can. 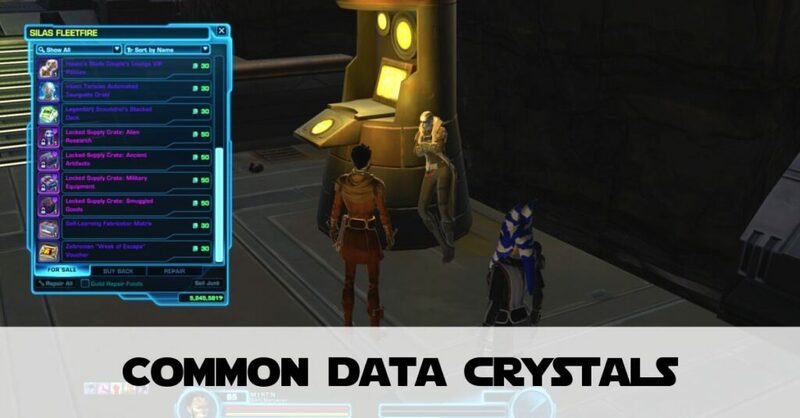 In 2015, SWTOR made the change from the old currency of ‘commendations’ to a system of crystals: Common Data Crystals, Glowing Data Crystals and Radiant Data Crystals. The latest tier of crafting allows you to create 208 Rating Purple-Grade Armour and Modifications. You can also make 212’s and 220’s with the right reverse engineering. This can lead you to question: what can you spend common data crystals on? Here is the ‘shortened’ answer! I’ve noticed people wanting a decent answer to this question when they land on my site, so I’ll try to be as thorough as possible! If you don’t have Armormech or Synthweaving crafting skill then you can’t make whole pieces of armour on your own. Thankfully, if you save your common data crystals up, then you can purchase 208 Moddable gear from vendors in various parts of the Galaxy. Where are the Common Data Crystals Vendors? Update: I forgot to add that Starter planets have Common Data Crystal Vendors usually selling good gear for around 8 Crystals for the appropriate classes. So these are found on: Tython, Korriban, Hutta and Ord Mantell. Although since Level Sync you usually leave the starter planet well over Level 10. So I’d advise saving them up to spend on better gear and/or mods on Fleet. Makeb: you can buy a speeder from the market area on Makeb. Should you choose do the Shadow of Revan storyline before embarking on Knights of the Fallen Empire, then you receive 297 Common Data Crystals upon completing Forged Alliances. You receive them once you land on Rishi). As individual armour components cost 80-120 Common Data Crystals (and shields/focuses/generators I think are 150), hoarding up to the maximum 1000 data crystals can get you pretty much a full set of 208 gear. 208 Rating Earpieces are also purchasable. If you’re a lower level, instead of paying out a ton of credits buying moddable shields/generators/focuses, you can purchase them for 6 Common Data Crystals from the ‘Adaptive Armour Vendor’ on Fleet. They come with low-level mods, but you can gear this up to your level. With the dawn of Fallen Empire the number of companions (or Allies) has exploded. And some gamers have said if you want to solo a Star Fortress, having companion influence of 25 or more can help your success on these missions. Outside of KotFE Chapters, you can’t improve their influence through conversations (e.g. on H2+ Missions), so companion gifts are the way forward. You receive gifts from the Commander’s Share of Alliance Crates. But you can also purchase extra gifts from the vendor on Odessan and on Fleet to boost your preferred companions’ influence level. Remember better influence affects combat performance but also crafting results (and an increased percentage chance of a critical ‘hit’ on crafting or gathering missions), so it’s a worthwhile investment. The hard slog towards a full Alliance (Influence level 20 with all Alliance Specialists) can be alleviated by using your common data crystals to buy Alliance Crates from the Vendor on Odessan. You gain companion gifts and data crystals (common, glowing and radiant) when you hit an even number of influence. So it really pays to use your common data crystals to buy crates for the Alliance Specialist who is nearest to the next multiple of 2. Pro Tip: Alliance Crates are bound to your legacy, so you can mail them to other characters within the same legacy to help build their alliance. No data crystals should go to waste! We Need a Crystal Exchange Vendor, BioWare! That way you still have to work hard to get the higher level currency, but your excess one could be put to could use. Just an idea! You can only bank up 1000 Common Data Crystals. When you get near (around the 800 mark), every time you earn more of them, you get a warning that you’re nearing your limit. So instead of getting annoyed at this persistent prompt, spend them. There are a few options to make sure you won’t lose out. From improved gear, to earpieces, to companion gifts. And by purchasing crates you can use your crystals on one character to benefit another character. Do you have any other ideas on how to spend your common data crystals? Add them to the comments and I may add your suggestion into the post! I would be far happier with the crystals if they had more vendors where you could reach during play. I don’t like being bugged with ‘your near your limit’ when the only option they give is to leave the planet and story to spend them! Especially as there IS a travel cost back. Thats credits I could spend on the GTN and get better than their crystals are offering. I don’t see why they have crystals for currency with such little in the way of really good stuff to spend it on. Outside companion gifts and a few decorations, only place I found anything was Ilum, with that speeder vendor. But not all my characters collect speeders, and not all have strongholds either. Absolutely – there aren’t enough planets with common data crystal vendors on them. To my knowledge I think you can find them on: Ilum, Rishi, Yavin IV, Zakuul and Odessen – as well as fleet of course. The way I get round it is to use the Alliance specialist Quick Travel to get back to Odessen – or if you’re on a specific planet add a Heroic Mission to your Mission Log via the Heroic Terminal and then use the Heroic Quick travel to avoid paying the transportation cost.